My Aunt and Uncle live a few blocks away. On a beautiful summer day a number of years ago now I was at home eating lunch when there was a knock on the door. It was my cousin Sheena’s friend Holly who had been staying with them short term. Sheena wasn’t at home and her brother Travis had parked my Uncle’s truck in the driveway and left to attend to something else. Holly was concerned because there was a bit of smoke coming from under the hood of my Uncle’s truck. Being the savvy person that I am I figured that the truck had overheated and that the smoke she saw was actually just steam. It was very hot out that day after all. Holly had walked over to my house so we got in my Dad’s truck and started to drive to my Aunt and Uncle’s place. As we drove closer I could see a cloud of smoke billowing into the air. At that point I knew that it was smoke and not steam because it was black, not the white billowy puff of steam. I drove a little faster. This was before everyone had cell phones, otherwise we could have called 911 right then. 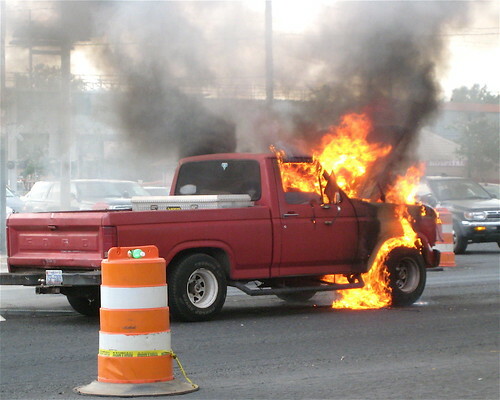 When we drove around the corner we could see the front end of my Uncle’s truck engulfed in flames. Luckily one of the neighbors had called 911 and the fire department was already on scene. The truck was destroyed but luckily my cousin had backed it into the driveway and the fire was in the front end so it didn’t do any damage to their house and no one was injured. Even the golf clubs in the back of the truck we spared from damage. Even though I thought that it was just steam coming from my Uncle’s truck I knew that I needed to treat the situation with some urgency. As much as it’s important to be patient in life there are times that require urgency. There are situations that we can take too seriously and situations that we can take too lightly. Learning which situations require what level of urgency can take some time and some mistakes, but you’ll be better for it in the long run. What do you need to treat with urgency?